The UK government seems to be huge difficulties about the possible next steps. Also because it no longer can decide what should happen. It is for others to decide ( UK parliament and the EU ). Most likely outcome : A majority of MPs against leaving without a deal. until exit from the EU. leaving without a deal can not appear on the ballot paper. prolongation of the period until exit. Likely outcome : A majority of MPs will support such a request to the EU. government intend to use the extra time for? one of them can block it. the same question as before ). a deal on March 29. If a prolongation is agreed, the question is : For how long ? elections on May 23-26, as the new European Parliament will start on July 2. UK to organise a new referendum. Or a general election. to take place in the UK on May 23-26. March 25-28 : European Parliament plenary session. huge and immediate consequences, esp. for the UK. a deal has never been greater! ( though it is not possible to foresee all possible scenarios ). The main WTO rule is that you have to treat all trading partners in the same way. always take time to negotiate. And they only come with conditions. The UK may abondon the Brexit operation by withdrawing the socalled art. 50 letter. The EU does not have to agree to it. If it is the British government or it also needs the agreement of the British parliament is another matter. But this possibility does not seem to be in the planning. If the UK on the other hand wants to extend the deadline to leave the EU it requires the agreement from each of the 27 EU governments and from the European Parliament. Such an agreement is probably not given without conditions. This has again been made very clear by president Macron and by chansellor Merkel. The negotiated Withdrawal Agreement agreed between the EU and the British government in a legally binding 585 page withdrawal agreement was made on November 14, 2018. It is accompanied by a 26 page not legally binding statement on future relations. The EU has at a European Council on November 25, 2018 unanimously agreed to the Agreement and underlined that this is the best and only possible agreement. The British Parliament rejected the Agreement by a huge margin of 230 votes on January 15, 2019. The UK Parliament on January 29 agreed with 317 votes against 301 to the Agreement ON THE CONDITION that its part on the backstop for the common border in Ireland was removed and replaced by « alternative arrangements ».. This has been refused by unanimity in the EU. PM May held meetings with the EU leadership in Brussels on February 7 and February 20 to try to have some legally binding changes. EU said once again that there is no way that the legally binding Withdrawal Agreement can be re-opened and re-negotiated. It is finalised and closed when the EU is concerned. The UK might obtain some further clarifications in the non-binding paper on future relations. Talks are also ongoing between EU negotiator Michel Barnier and the UK Brexit minister. But this is probably not enough to change the majority in the UK Parliament. On Monday, February 4, a number of British Parliamentarians met Guy Verhofstadt from the European Parliament and Martin Selmayr, secretary-general of the Commission. They were informed that no changes were possible. PM Theresa May has also started talks with the leader of the British opposition, leader of the Labour party, Jeremy Corbyn. Unlike May it is a badly hidden fact that Corbyn has always been very critical and de facto is anti-EU. Therefore, he is not expected to accept either to abandon Brexit or to agree to a future close relationship to the EU ( such as Norway ). The question is, if his overwhelmingly EU-positive Labour MPs will accept his line at the end of the process. He has in his first meeting with May suggested that the UK remains in EU’s Customs Union and also in part of the single market. In addition he wants workers’ rights to be safeguarded in the new situation. If PM May agrees to these proposals it would, of course, be a very new situation. they will not be « the cup of tea » for the hardline Brexiteers. PM May has on May 10 replied to Mr. Corbyn that she does not agree to his suggestion about UK staying in the customs union with the EU. But she looks forward to further talks about finding a solution. Other members of the Labour leadership ( John MacDonnell and Keir Starmer ) have said, that if the government does not agree to Labour’s suggestions, Labour will propose a second referendum. Mr. Corbyn has on February 25 said publicly that if Labour’s proposal will not be adopted in Parliament he and Labour will propose a second referendum ! The two crucial questions are : 1. What will the question to the voters be ? Will the possibility for the UK to stay a full member of the EU be one of them ? 2. And if that is the case, will Labour then support this option ? EU negotiator Michel Barnier made it in talks with the UK government on February 11 clear that the next move has to come from the UK side. F.ex. by accepting that the whole of the UK stays permanently in the Customs Union. PM May has said that she aims at a vote in Parliament at the latest on March 12. NEW : On February 26 PM further stated, that if the government’s final proposal is not accepted by Parliament in the vote on March 12, she will make a new proposal to ask, if parliament supports a no-deal Brexit, meaning that the UK will only leave without a deal on March 29, if a majority in parliament agrees to it. This will be voted on March 13. And if that fails too the government will make a third proposal on a short extension of the two-year article 50 negotiation process. PM May emphasized that she if needed wanted this extension be short, up to three months. This proposal will be voted on March 14. Many in the UK have warned strongly against leaving the EU without any deal, not least the business community, but also Mr. Corbyn and many Conservative MPs too. At the same time concrete, practical preparations for a no-deal situation are on-going in all EU member states and in the UK. British industry has via its organisation CBI on Feb. 11 called the present situation « an emergency zone ». And the National Farmers’ Union has declared that exit from the EU without a deal will be disastrous for British farmers. As of February 2019 only 40,000 businesses have registered for an Economic Operator Registration and Identification (EORI) number. This is a basic requirement for businesses trading between the EU and a ‘third country’. There is an estimated 240,000 EU-only trading businesses that will need to apply for this number. In a ‘no deal’ scenario the UK economy is expected to be 6.3-9% smaller in the long term (15 years) than it otherwise would have been assuming no action is taken. The North East of England would be the most impacted region (-10.5%). Impact on the UK’s agriculture, forestry or fishing industries would have particular effects in Scotland. ONS figures demonstrate that these three industries account for 1.21% of Scotland’s economy, compared to 0.46% of England’s. Around 92% of Welsh lamb exports by value go to the EU. Consequently, disruption to animal exports would likely be felt strongly by the Welsh lamb industry. Impacts on the UK’s food and drink sector would be more pronounced in Wales, Scotland, and particularly Northern Ireland, where the sector comprises 5.07% of the economy, compared to 1.38% for England. The cumulative impact of a ‘no deal’ is expected to be more severe in Northern Ireland than any other region and the paper states that it will soon publish details on how trade will operate on the island of Ireland in a ‘no deal’ scenario. Business failure and potential relocation to Ireland are highlighted as risks. Operation of the Single Electricity Market, crime and security cross-border cooperation, and potential increase in community tensions are also mentioned. The administrative burden for businesses to complete customs formalities could be around £13bn p.a. (not accounting for any behavioural change). The flow of goods is expected to be seriously disrupted due to the introduction of customs formalities and checks at EU and UK ports. The UK Government’s worst case planning assumption is that, as a result of French checks and lack of businesses readiness, the flow of goods through the Short Channel Crossings (Dover and Eurotunnel) could be very significantly reduced for months. Some food shortages are expected as 10% of food items will be directly impacted by delays across the Short Channel Crossings. Tariffs on UK exports are also going to have an impact with a case study of the automotive industry supplied in the paper. In 2018, 81.5% of UK vehicle production (1.24 million vehicle) was exported. 42.8% of UK vehicle production was exported to the EU27. In a ‘no deal’ scenario a 10% tariff would be applied on finished vehicles, and around 2.5 - 4% tariff on components. This cost is expected to be passed on to consumers. Details on the UK’s tariff schedule will be published in due course. Significant impacts for the service sector are also listed including market access, and non-tariff barriers on establishment and service provision based on nationality requirements, mobility, recognition of qualifications and regulatory barriers when setting up subsidiaries in EU member states. Specific examples provided include lawyers losing the right to provide ‘fly in fly out’ services and financial services firms losing the right to conduct cross-border business. No costs are attached to these impacts. The regulatory impact for harmonized sectors is also highlighted with increased costs for businesses exporting to the UK in these sectors due to the need to have their products tested by an EU27-based assessment body. The chemicals sector is provided as an example with UK businesses holding over 12,000 registrations for manufacturing or importing substances. In a ‘no deal’ these registrations would need to be transferred to an EU-based entity if these businesses want to continue to sell into the EU. A transfer fee for a single registration is £1,500 excluding admin costs. And the need to comply with both UK and EU requirements will lead to a duplication of costs and process in addition to an average 5% EU tariff on these chemicals. Mutual recognition for non-harmonised goods will also cease to apply meaning exporters may have to meet the requirements of each EU country that they export to depending on how they export their products. Although it is noted that this will impact a minority of trade and it is expected that a majority of trade in non-harmonised goods will be able to continue. There is likely to be a gap in the lawful free flow of data in a ‘no deal’ as the EU will only begin the process of granting the UK an adequacy decision after its departure. Businesses are advised to look at alternative arrangements in the absence of this decision. UK nationals will lose the automatic right to undertake paid activity while travelling to the EU unless a visa for this purpose is sought. The Scottish government and the Welsh government have asked for a prolongation of the March 29 deadline to ensure more time to reach a deal. But the Mrs. May continues to insist that she « will deliver Brexit on time ». The UK may abondon the Brexit operation by withdrawing the socalled art. 50 letter. The EU does not have to agree to it. If it is the British government or it also needs the agreement of the British parliament is another matter. If the UK on the other hand wants to extend the deadline to leave the EU it requires the agreement from each of the 27 EU governments and from the European Parliament. Such an agreement is probably not given without conditions. The negotiated withdrawal deal agreed between the EU and the British government in a legally binding 585 page withdrawal agreement in November 2018. It is accompanied by a 26 page not legally binding statement on future relations. The EU has unanimously agreed to the Agreement and underlined that this is the best and only possible agreement. 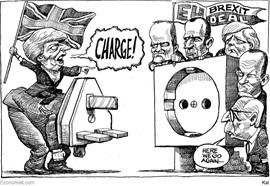 The British Parliament rejected the agreement by a huge margin of 230 votes in January 2019. The UK Parliament later in January agreed to the Agreement that the part on the backstop for the common border in Ireland was withdrawn and significantly rewritten. This has been refused by unanimity in the EU. PM May will hold meetings with the EU leadership in Brussels to have some changes. It is very, very unlikely that she will get anything on the withdrawal agreement. It is finalised and closed when the EU is concerned. If she might obtain some further clarifications on the non-binding paper on future relations remains to be seen. But this is probably not enough to change the majority in the UK Parliament. If PM May has her deal rejected in Parliament once again mid February, when the next vote takes place, will it then be politically possible for her to stay on ? - Or to let the UK leave without a deal with the EU ( with all the very serious consequences). The UK government organised a referendum on June 23, 2016. Altogether 33 million voters took part. This was a turnout of 72 %.